Start a career as a professional helicopter pilot and fulfill your dream! Location: St-Hubert airport near Montreal. Duration: approximately 90 minutes including a 30 minutes flight. This package is designed for people that wants to start a career as a profesional helicopter pilot.
. First follow a ground school session on the helicopter world and the helicopter controls.
. Than take place in the pilot seat and take-off with an instructor by your side, Once in flight take the control of the helicopter and experience the magic feeling of flying. 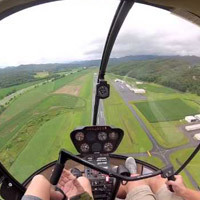 You will perform various maneuvers and also experience the stationary flight that defines the helicopter flight.
. Take a guided tour of the facilities. You will see the simulator, the hangar with all the aircrafts and you will meet instructors and support staff.
. You will receive a detailed information package and get a presentation on the unfolding of the commercial pilot training and the steps to launch your career. A pilot cap will be given to you to mark the launch of your pilot career and a substantial credit will be offered to you on you training inscription fees (A value of 250$!) . Your flight time of the day will be immediately registered and will count toward your training time log. Maximum weight of 220 lbs.